Weather at the Great Ocean Road. The road may span over only 243 kilometres, but the Great Ocean Road weather and climate has an extreme and versatile range. Depending on whether you are meandering along the coast, venturing into the wetlands, or exploring the Otways, you will experience a vast range of temperature, humidity, and rainfall. In the wetlands, you will find many small, shallow lakes and marshes, which contribute greatly to the eco-system of the Great Ocean Road as a whole. 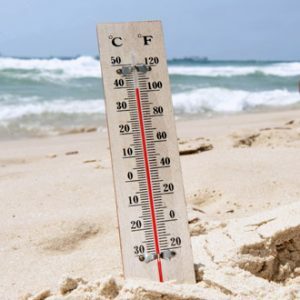 The temperatures here can be quite high in summer, especially in comparison to the coastal areas. This is because the wetlands are enclosed by numerous hills, and are therefore sheltered from the cooling coastal sea breeze. The high humidity in this area contributes to its being an ideal reproduction spot for many varieties of indigenous fauna and flora. When exploring the coastal areas, such as Apollo Bay, you will experience much colder and windier conditions, because of the cliffs being so exposed. This area is also much dryer, bordering on arid, in comparison to other areas along the Ocean Road, and you will find little lush plant life here. When visiting the rainforest areas around Cape Otway, you will find that the weather is usually very wet; showers are quick to appear and then disappear again, leaving the land constantly moist. Within the thick canopy of tree tops, the moisture hovers, leaving the forest in a constant state of humidity. Plants thrive in this luscious environment, and where there are plants, there are animals. Winter days on the Great Ocean Road are still warm enough to travel, as long as visitors are appropriately dressed and carry wet-weather gear. Evenings are chillier, but never slip below freezing. Summers may get quite hot, but are still bearable, often thanks to the soothing coastal breeze which reaches most of the sections.